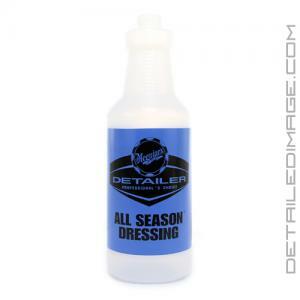 Meguiar's All Season Dressing Bottle (32 oz) is the perfect bottle to pair with the Meguiar's All Season Dressing. This bottle is color coded and pre-labeled as "All Season Dressing" so you will never confuse this product for another. It is also OSHA compliant so it meets all of the government's guidelines for occupational safety. It does not come with a trigger but the DI Accessories Chemical Resistant Spray Trigger is a perfect fit and it is chemical resistant so it will withstand the chemicals in the All Season Dressing, or any other product you may be using. The bottle is 32 ounces and has measurements on it to help you dilute the All Season Dressing properly. 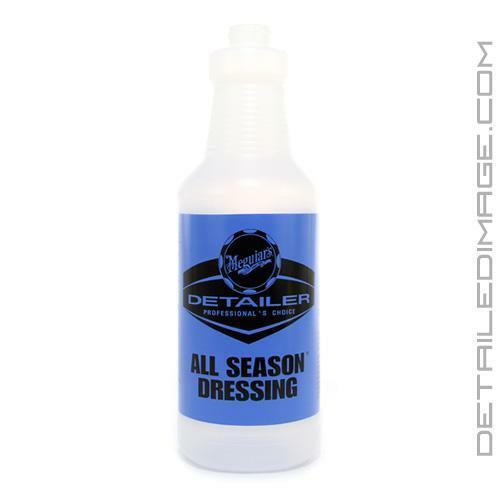 If you are looking for a durable bottle that is pre-labeled to help avoid confusion then the Meguiar's All Season Dressing Bottle is for you. "ALL SEASON Meguiar's All Season Dressing *Meets CARB's VOC limit for Rubber/Vinyl Protectant formula that produces a deep, rich, long lasting shine on all exterior rubber and plastic surfaces. Old or new, weathered or worn, All Season Dressing will give you the desired results time after time." Like using these bottles for the easy way of determining the right product at the right time. Or if you have a helper it makes getting the right product easier.